When Garrett at Cricket Trailer set out to combine his expertise in the design of small living quarters honed working for NASA on the Habitation Module of the International Space Station with his interest in camping, the concept of an "innovative, lightweight, compact, and flexible small environment" in which to travel and explore was born. 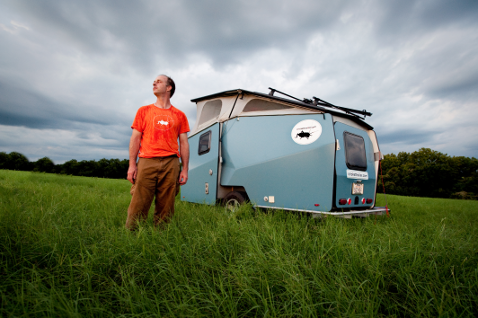 As he worked through the design process, it eventually came time to address the need for a toilet and shower in his creative camper. Logically he set out to find the right curtain track that could be used to hang a curtain that would offer privacy and retain water. That's were the relationship between Cricket Trailers and Curtain-Tracks.con was born. In the case of the Cricket Trailer, you can see below that the track needed to be formed into a U shaped configuration with a fairly tight bend radius. The 4108 aluminum I beam track is an ideal selection. The anodized aluminum doesn't rust or corrode, and the mounting hardware allows for the track to be mounted on the ceiling while maintaining a low profile. The 4121 wheeled carriers move easily from side to side, making opening and closing the shower curtain effortless. This curtain track can be bent to a 2 inch radius, tighter than any other track on the market. The shower curtain track assembly shown below uses the 4121 carriers in combination with a traditional shower curtain ring. Another option that would allow the curtain to be suspended closer to the track would be the use of the 4121-BBTS carriers that include a shackle to attach the shower curtain to the carrier. Either option works fine. For customers who are looking to use this type curtain track to hang shower curtains, the 4372 Shower Curtain Track Kit is a very good option. It contains the same aluminum I beam in a 6 ft section, and also includes the carriers, end stops and ceiling brackets. The track is shipped straight, but can easily be bent to form whatever path is needed. That may be to form an angled L shape around the side and end off a shower, or to form a rounded U shape that encloses a shower on 3 sides. If a longer track is needed, you can combine two kits with a 4128 splicer or you can build the same functionality with an eight foot section of 4108 I beam curtain track and the accessories needed to meet your needs. We really enjoy working with customers to tackle their design projects and seeing them come to fruition. It's nice to be able to generate a little extra publicity for our customers and share their efforts which in turn helps other customers conceptualize what may work to meet their own needs. 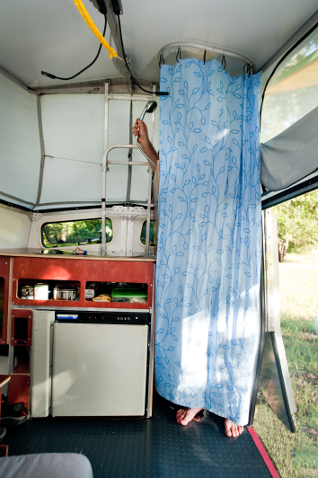 Regardless, we look forward to seeing Cricket Trailers on the road and in the campgrounds, and to helping put shower curtain tracks exactly where they are needed. Let us know how we can help, and be sure to share a picture of your project too!